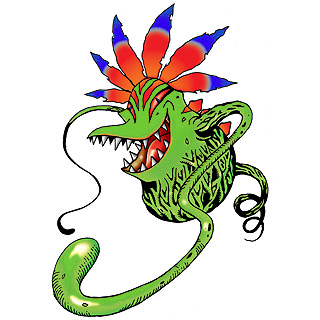 A Insectivorous Plant Type Digimon with long extendable ivy vines and a mouth that can open to a great size. By spitting out a sweet fragrance from its mouth which hangs in the air, it lures small-sized Digimon, but it is an atrocious and brutal Digimon who drags them towards it with the tentacles hidden in the long ivy parts, however, because it doesn't have any real attack power, it cannot compete with Large-sized Digimon. 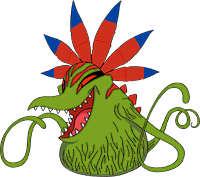 When Vegiemon grows, the flower attached to it blooms and the truth is revealed. The last sentence in his profile hints at his evolution to Vademon. Origin / English. Vegie is slang for vegetable or vegetation. Origin / English. Veggie is slang for vegetable or vegetation.